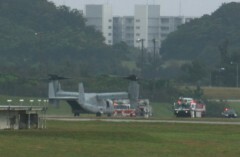 At around 12:30 p.m. March 2, white smoke rose from the right engine of an MV-22 Osprey aircraft after it landed at Kadena Air Base. This vertical take-off and landing transport aircraft belongs to U.S. Marine Corps Futenma Air Station. A witness speculated that something had gone wrong with the aircraft. This aircraft is one of the MV-22 Ospreys deployed to Futenma base in October 2012. According to the witness, the aircraft landed at Kadena Air Base at around 12:30 p.m., and two fire-fighting vehicles, which were waiting near the runway, approached its fuselage immediately after the aircraft landed. After the crew checked the aircraft, it moved by itself to the parking lot at around 12:45 p.m.